Enabling these checkboxes gives you access to vital organization features in Frazer. If you seperate vehicles, customers, and sales by certain types or attributes, these settings enable you to print reports with those categories in mind. Open Print Forms after completing a sale/saving a prospect. 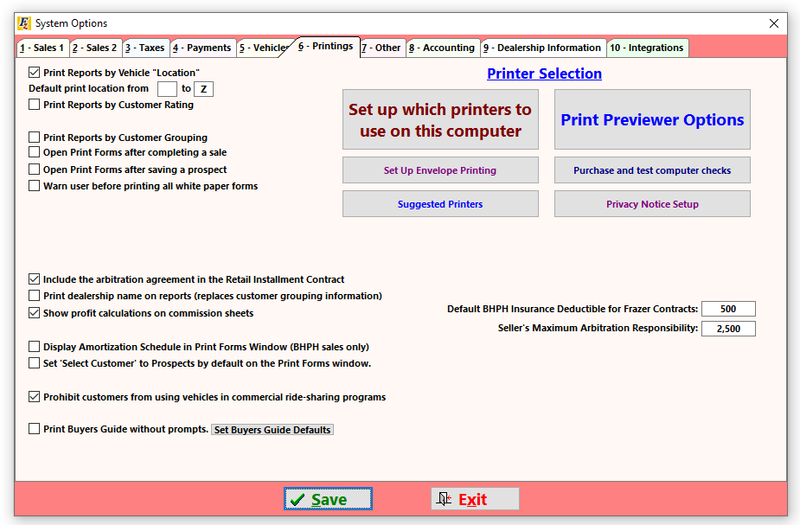 These settings will automatically bring up the “Print Forms” window after completing a sale or saving a prospect. This box adds a warning that pops up when you click the "Print All White Paper Forms" button. This can prevent you from printing every single form before you're ready. Check this to automatically print Frazer's arbitration agreement after your Retail Installment Contract. Note : We highly suggest using an Arbitration Agreement as it prevents class action law suits and allows legal disputes to be settled outside of court. This check-box is checked by default in all Frazer systems. This setting replaces some info at the top of reports with the dealership name/address. This is useful if you need to submit reports to third party groups. Check this box to add commission calculation methods to your commission sheets. This is useful when you want to explain your commission totals to your salespeople. Check this to add a form in Print Forms called Amortization Schedule. This will let you print the amortization quickly and easily for any customer. If this is not checked, the option to print an amortization schedule can be found in Customers > B. Customer Processing > A. Customer Information and Costs > and then switch to the Payment Schedule tab. The button is on that tab. This area in System Options can vary wildly depending on your state, and you may not see it at all! Clicking this button, however, will give you access to any temp tag vendors that may be available for your state. Frazer allows you to select a different printer for 4 primary form/printout types : Reports Letters and Labels, Pre-Printed Forms, Receipts, and White Paper Forms. Most dealers will select the same laser or inkjet printer for Reports, Letters, Labels, Receipts, and White Paper Forms. Theyll usually select an okidata 320 turbo or nothing at all for Pre-Printed Forms. For more information about printing and printer selection click here! Clicking this button will bring up a list of the printers we recommend for printing smaller format receipts and preprinted forms. Frazer includes a pdf program that is used to preview the reports form Frazer. If you'd rather use one you're more familiar with, feel free to change it here. Federal law requires that you explain how you use your customer's information to them in writing. Use this screen to setup the privacy notice per your dealership's requirements.